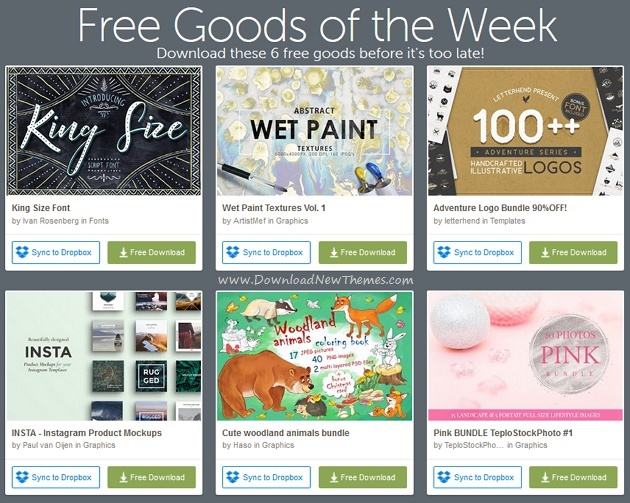 Download this weeks awesome 6 free premium graphics design files before its too late! they are as follows: King size premium font, Wet paint Texture vol.1, Adventure logo bundle templates, Insta - Instagram product mockups, Cute woodland animals bundle graphics elements and Pink bundle teplo stock photo. They have released Free Goods of the Week on 1st May 2017. They’re available until midnight of 7th May 2017. Grab this weeks freebies across Creative Market. Item Reviewed: Free 6 Awesome Premium Graphics Design Goods No118 9 out of 10 based on 10 ratings. 9 user reviews.